We all hear about waste and fraud in digital advertising. But how much of your ad budget is wasted? Where is the waste coming from? And what can you do about it? We’ll dive into five forms of ad waste and fraud and look at options you can use to reduce or eliminate them in your next ad budget. Some solutions reduce ad waste by degrees. Others go to the root of the problem by bypassing traditional ad plumbing and work more directly with consumers. Ad industry luminary Faris Yakob of nomadic agency Genius Steals, muses on turning an ad dollar into two quarters. Maybe will do half-off coupons instead. The tweet was a hat tip to merchant John Wanamaker’s often-quoted, 100 year old lament about advertising. Surely, with the mountain of data that digital advertising provides, modern marketers can now, one hundred years later, clearly see which half is wasted and — swipe! — eliminate it, right? Sadly, digital advertising has it’s own set of waste, fraud and hidden gremlins to frustrate modern marketers. Faris was only half joking. Roccarra Baker, Product Marketing at Adobe Advertising Cloud, says that as little as 17% — yikes! — of your ad budget might be going toward a customer seeing your ad. Where exactly are all these quarters, nickels and dimes going exactly? Bob Hoffman, aka the Ad Contrarian, takes us on a bumpy journey as a single dollar is spent on display advertising and (some of it) eventually makes its way to a human viewer. Sadly, after the middleman technology fees, ads that are never seen, fraud and other waste, he ends up with just 3¢ of a programmatic display ad finally reaching a human set of eyes. A dollar turns into three pennies. What exactly are draining your ad budgets? And what can you do to avoid it? Your ad was served, but it wasn’t viewed or was viewed so briefly that you might as well consider it not viewed. If the ad platform you’re advertising on uses the popular iab and Media Rating Council (MRC) standard, you paid for a “view” if 50% of the ad was within view for a second for display ads or two seconds for video. 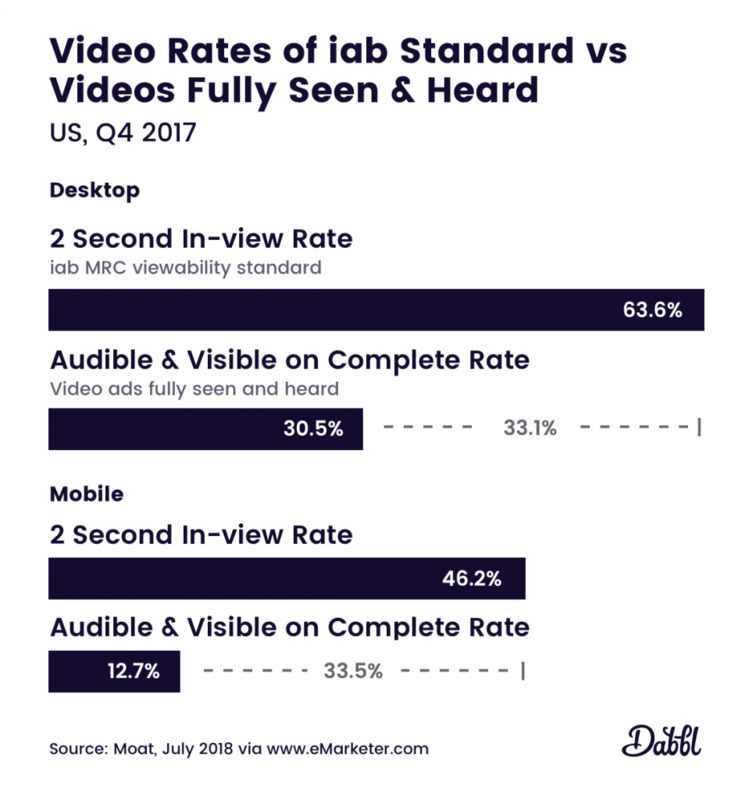 The measurements below via Moat and emarketer.com suggest that half (52%) of the desktop video ads that advertisers pay for using the iab standard are user experiences that do not deliver complete views with audio. That’s 33.1% of all measurable desktop video ad impressions. On mobile, nearly 3 out of 4 (72.5%) mobile video ads that advertisers pay for using the iab standard are user experiences that do not deliver complete views with audio. That’s 33.5% of all measurable mobile video ad impressions. Marketers know these are lackluster definitions of a view but they struggle to agree on viewability definitions. Determine whether you want to pay for ads that are not viewed. Are you paying for half of your display or video ad to be seen for one or two seconds via the iab MRC standard? Facebook charges for 10 second and 3 second video views. This could be 10 or 3 seconds via silent autoplay as someone scrolls through their feed. Also note how they measure views. If someone watches a 5-second video for 4.85 seconds, or a 10-second video for 9.7 seconds, that counts as a 10-second video view. Avg. CPV (cost per view) is the average amount you pay when a viewer watches 30 seconds of your video (or the duration if it’s shorter than 30 seconds) or engages with your video, whichever comes first. Twitter offers two types of video views: the iab standard of 50% of pixels in view for 2 seconds or, alternatively, 100% in view for 3 seconds or more. Media firm GroupM has defined an alternative definition of a view where 100% of a display ad must be viewable for any amount of time. For video, a user must initiate the video, the sound must be on, it must be 100% in view and the viewer must complete at least 50% of the video. Advertisers on Dabbl only pay when consumers complete 100% of a brand experience which may include video and other engagements like multiple choice questions. These experiences average 35 seconds across Dabbl. The above looks at ad waste via viewability issues with legitimate publishers. What about ads that are never seen due to fraud, either via fraudulent publishers or fraudsters using legitimate publishers? Pixel stuffing is where fraudsters display one or more ads in a 1×1 pixel. Ad stacking is displaying multiple ads on top of each other. There is “counterfeit inventory” and “unauthorized reselling” generated by fraudulent websites with fraudulent traffic and fraudulent clicks. There are fraudulent bots with varying degrees of sophistication. What percentage of digital ad budgets are being gobbled up by fraud? Hoffman, for one, is not optimistic. iab’s ads.txt is designed to tackle one specific type of fraud in programmatic advertising: counterfeit inventory fraud. Publishers like CNN, The New York Times, Techcrunch publish an ads.txt file to their websites that let advertisers know which selling platforms are authorized to sell their ad inventory. If you see that publisher on an ad platform that’s not on the publisher’s ads.txt list, it’s probably a fraud. You can also advertise directly in channels that offer more stringent audience verification methods. Dabbl uses various authentication methods such as a mobile phone number verification process and using unique device ids to ensure real humans view advertisers’ published experiences. Brands don’t want their ad budgets associated with or sponsoring those who promote terrorism, violence, racism, sexism, hate, fake news and other questionable content. This is a type of waste that can do harm to the advertising brand. Large, ad-supported platforms that rely on user generated content like YouTube and Facebook as well as large ad networks of websites that are difficult to police all face this issue. Know where your ads are being displayed. For the ad networks that allow it, one option is to use third party brand safety verification tools from vendors such as Integral Ad Science, DoubleVerify, Adloox and OpenSlate. On Dabbl, the brand advertisement gets 100% of the attention and screen real estate. There is no user generated or other media content — whether it be questionable or otherwise — for brands to be associated with. Some types of ad waste are harder to define but easy to understand. Let’s assume your ad makes it through that maze of waste and fraud to finally reach a human being. Rather than filling this viewer with the joy, the belly laughs, or the tugs of the heart-strings that your ad was designed to evoke, it annoys her instead. She grumbles through your ad, waiting to view the content she came for. Let people choose. Let people opt in. Permission is the key here. The best performance happens when both parties want to be together. People who are given the ability to choose not only whether to engage with an ad, but also given the ability to choose when they engage offer the greatest performance. Permission-based marketing such as content marketing, social media marketing and email marketing work only when consumers opt in to receive communication from brands. 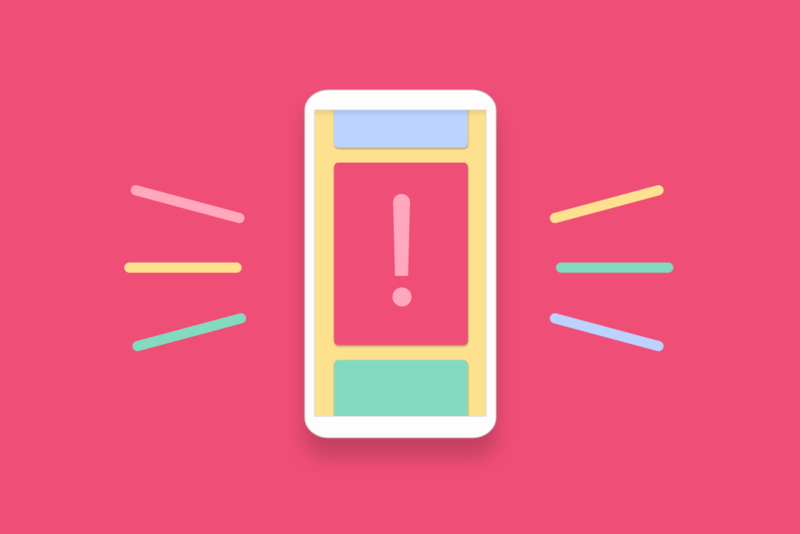 Permission-based advertising combines the opt-in format similar to the marketing methods above while retaining paid advertising’s benefit of near instant reach. On Dabbl, a permission-based advertising platform, users decide whether and when to engage with partner brand and agency advertisers. By Hoffman’s tally, the largest share, 60¢ for every dollar, went to this group. This is the long chain of ad tech players that take their cut for additional services offered. In programmatic advertising this can include trading desks, demand side platforms (DSP), data providers and ad exchanges, among others, taking their cut. All these middlemen will say that they add value to your media buy by precision targeting your ad at your perfect customer at the perfect time. Right. So maybe instead of 6 clicks per 10,000 ads (yeah, that’s about average) you’ll get, who knows, maybe 8. Break out the champagne! Get closer to the consumers you want to reach. Dabbl bypasses the traditional middlemen gatekeepers — even bypassing media publishers — so that brands and agencies can reach consumers more directly. Instead of running ads that interrupt consumers’ media consumption, advertisers share their ad budget directly with consumers. Whether it’s Hoffman’s 97¢, Baker’s 83¢ or Faris’ 50¢ of every dollar going to waste and fraud, how well would your advertising perform if you could redirect more of that wasted budget toward your future customers? By offering a part of your ad budget with consumers you can bypass the wasteful items above. Offering a portion of your ad budget to consumers makes your brand the center of attention. This eliminates competing with other media that causes the viewability issues of waste item #1. It also eliminates the annoying interruptions that cause waste item #3 and the brand safety issues of waste item #4. It also allows for the bypassing of middlemen gatekeepers at the root of waste item #5. In exchange for that value that your brand shares with consumers, requiring more stringent authentication eliminates the fraud issues of waste item #2. Share that otherwise wasted ad budget with consumers instead.